LED Matrix Shades Have Arrived! 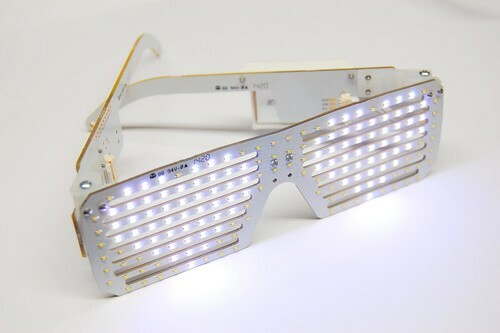 A quick introduction: LED Matrix Shades are a very cool piece of wearable technology that integrates a fully hackable Arduino-compatible processor with an LED matrix you can see through. They are the ultimate attention grabber at social events, and inspires curiosity among technology enthusiasts of all ages. 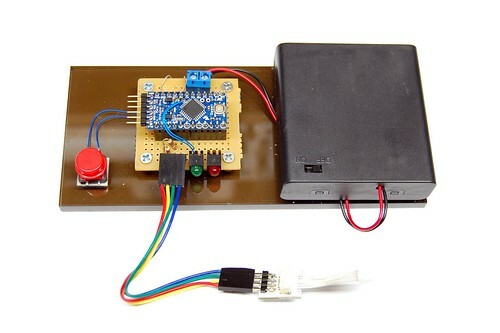 Every function can be reprogrammed by the user, and there are even places to solder your own circuits and sensors. If you're in the process of designing and building your own device, I hope our story helps you avoid a few pitfalls. 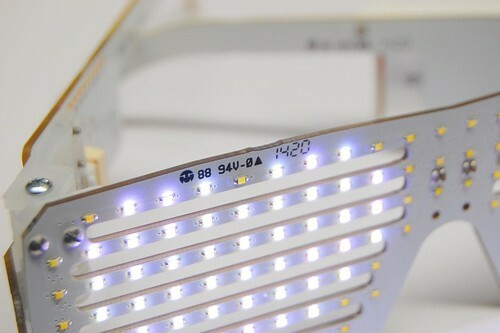 It's been a long journey getting more LED Matrix Shades in stock. We launched our first batch at Maker Faire Bay Area 2013, quickly selling out the 50 sets we'd assembled (with the help of our awesome friends) the previous week. However, there were some problems with the remaining 50 of our first manufacturing run. A few issues with soldering, and some bad PCBs. That meant we had to painstakingly test, diagnose, and repair many of the remaining LED Matrix Shades, and even scrap a number of them as unrepairable. The main culprit was a pair of WLCSP-20 chips (0.5mm BGA), which are fairly difficult to rework with hobby-level equipment. Fortunately we had stainless steel stencils and reflow tools, but would often have to discard the expensive chips just to try again. 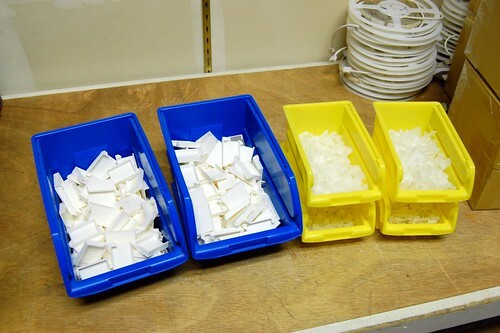 In the meantime, we were seeing supply shortages for critical parts, and negotiating with several PCB assembly houses for the special requirements we needed. A couple of deals fell through due to communication, pricing, or scheduling conflicts. Finally, we were referred to an assembly house that a friend had used for complex PCBs for over 15 years. Everything looked good and they were confident they could do the job, so we pulled the trigger and ordered 200 sets of PCBs. We're very happy with the LED brightness and uniformity. There's just one small issue you might not have noticed in the picture above. Zoom in and enhance! That's a mark the PCB manufacturer added to the top silkscreen of our PCB. We'd specified no silkscreen on the top (delivering an empty Gerber file) but didn't realize they would want to add a mark. It ended up in the worst possible place, over the right eye. Maybe we're just being picky and no one will notice, but to us that's really disappointing. So we're going to sell this batch at the lowest price we can afford, similar to our ChronoDoh adventure a couple years ago. 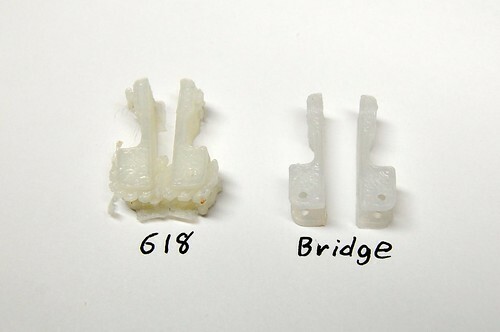 There's another bottleneck in our process, which is that we're currently using 3D printed parts on these. Right now our production volume is stuck between two levels...too low to buy injection molds, and high enough to make 3D printing painful. 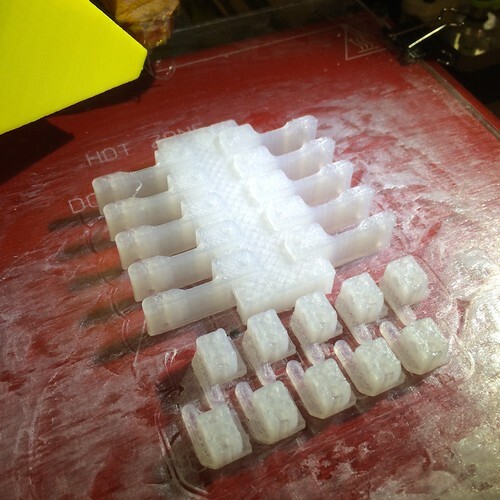 We have improved our processes enough to make the 3D printing a lot easier than last time, though. For the high stress parts, we were using Taulman 618 Nylon since it was very strong and flexible. It required frequent oven-drying, storage in a sealed container, warped a bit, and had to be printed on a sheet of Garolite which would sometimes stick too hard. Now, we're using Taulman Bridge which has been an absolute dream compared to 618. We're printing on glass with Elmer's glue stick, and seeing practically no warping, no need for drying the filament, and easy removal. We've also stopped using difficult to remove support material, and simply drop in a large support block at a certain point during the print. The hinges come off the printbed ready to use, rather than requiring minutes of careful trimming with a razor. Testing the LED Matrix Shades also used to be a fairly tedious process. 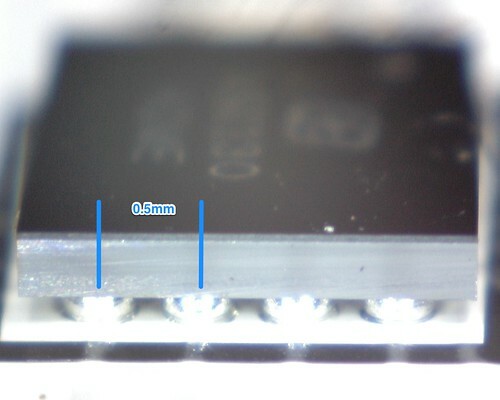 Essentially, display a pattern on the LED matrix, and visually inspect for any missing, too dim, or too bright LEDs. We missed a number of failures this way, and it sometimes wouldn't catch problems like a whole column shorted together. The matrix control chip we use (AS1130) has built-in diagnostics, so we were able to create a handy test module. 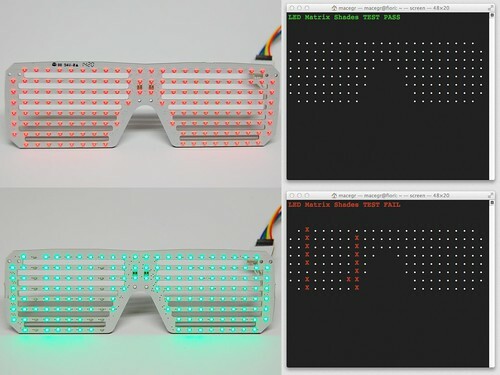 The tester is based around a Sparkfun Arduino Pro Mini, running essentially the same code as the actual LED Matrix Shades. It also triggers a self-test a few times per second, comparing the results against the expected pattern of missing and present LEDs. If everything's good, it will light the green LED. If even a single LED is not working right, it will light the red LED. For convenience during diagnosis and repair, it will also output a map of the LED Shades over the serial port. This process can detect both shorts and opens in the matrix, since a short will appear as a whole column full of LEDs (which in normal operation isn't the case). Every time we manufacture something, we learn a few more lessons. The big one is that you shouldn't expect different factories to approach problems the same way; something that worked fine before might blindside you. Over-specify every detail, provide photos of the finished prototype, and inspect the actual Gerber files that are going to production before letting them start. We're ramping up assembly now, and shipping out a few pre-orders. The price we've chosen for this batch is only due to the unexpected silkscreen mark, and won't ever be this low again...we'll do our very best to make sure there are no problems with the next batch! We're also working hard on the new RGB Shades, but those are at least a few weeks out still. The construction is a lot simpler, so we believe that the production run will have fewer problems. Submitted by Garrett on Sun, 06/29/2014 - 00:56. Submitted by Nada Vyapooree (not verified) on Tue, 11/11/2014 - 20:42. Hi I would like to know if you are selling the led shade with audio activated sensor. How much is it if you have it and how much will it cost to post to London, United Kingdom. Submitted by Bert Sierra (not verified) on Fri, 02/06/2015 - 07:08. Submitted by Bert Sierra (not verified) on Fri, 02/06/2015 - 07:10. I forgot to mention that, like Nada Vyapooree, I’d be interested in audio input capability, but USB for realtime data input might suffice as a bare minimum from the current version.